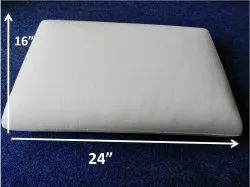 Leading Manufacturer of memory foam pillow from Sahibabad. With our rich expertise and exposure in this domain, we bring forth a beautiful collection of Memory Foam Cushions to our valuable clients. The offered range of product is designed by skilled and experienced professionals with the help of ultra-modern techniques at vendor end. Our offered range of product is quality tested by the best quality experts to ensure that we are offering a defect free range to our valuable customers from our end.